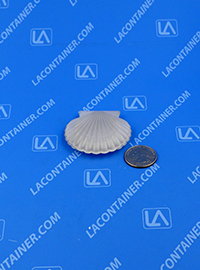 Seashell shaped unique sample Containers for cosmetics and beauty supplies made from FDA compliant clarified polypropylene. 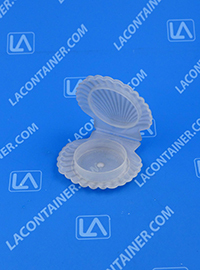 Unique seashell plastic container shape is perfect for beauty supply and cosmetics sample packaging. These sample containers are manufactured in The USA from the highest quality FDA compliant and BPA Free polypropylene plastic, making them the perfect choice for final product packaging which require no harmful chemical contaminants. The flat clear bottoms on these containers are great for applying logo labels and ingredients labels. They can also be molded in the color of your choice upon request (minimum orders apply). Product is available only in clear, white, and transparent pink through our online container store. 1.15" Dia. X 0.285" Ht. 55.37mm Dia. X 11.17mm Ht. 29.21mm Dia. X 7.24mm Ht.